Mumbai, 8th February, 2018: Kokuyo Camlin Ltd, premier stationery brand has associated with The Kala Ghoda Arts Festival - an annual festival with a kaleidoscope of music, dance, theatre, literature, food, street stalls, visual arts, urban design and heritage walks. Kokuyo Camlin along with Rachana Sansad College of Fine Arts & Craft has put up an installation at the Kala Ghoda Arts Festival, Mumbai. The festival is on from 3rd to 11th February, 2018. The installation is based on the theme Nature and the objective is to glorify the name itself - 'Kala Ghoda' which means the black horse. The unique installation is divided into the sketch of the horse in 5 different panels from both the sides. It is conceptualized in terms of language, geography, and passion for nature. The viewers’ get to reflect, observe, experience and reason out the installation. 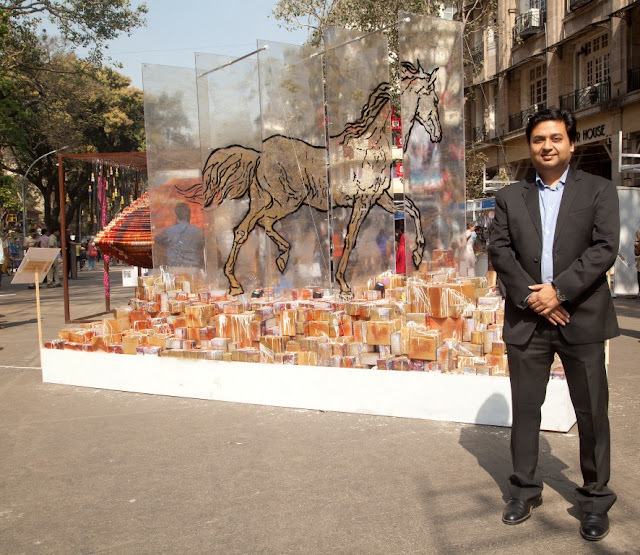 The Festival organized by the Kala Ghoda Association, a non-profit organization has grown in stature and popularity, from its inception in 1999 attracting visitors and participants not only from India, but across the globe. Saumitra Prasad, Chief Marketing Officer, Kokuyo Camlin said, “The installation has come out beautifully and is unique in its own right. We are grateful to Rachana Sansad College of Fine Arts & Craft for putting up such a wonderful piece of architecture and at the same time are honored to associate with The Kala Ghoda Arts Festival. Our installation also sends out a social message to conserve the Mother Nature and save the planet earth. Kala Ghoda Festival is very different in terms of its presentation as it not only engages artists and art lovers, but also the laymen. The installation is approximately 10 feet high and 5 feet wide with a length of 15 feet. There are 5 glass panels of 10 x 2 feet each with lazor light play on the horse that is embellished with Camlin Sparkle colour on the acrylic panels. The panels are grounded in a plywood panel which in turn will be covered with Camlin Sparkle tubes.